Marston has three holiday apartments which sleep 4-6 guests comfortably. The property nestles on the cliff top at Burlington Chine and two flats have stunning sea views across to the Isle of Wight. The apartments are ideally situated for a relaxing family holiday with the blue award beach only 20m away, or for quiet out of season breaks to follow pursuits of hiking, bird watching and diving, or just simply to unwind. Swanage town centre is a short stroll away along the sea front where you will find a diverse selection of eating houses, bars and shops in an 'untouched' traditional seaside town. All the flats have two bedrooms, bathroom, kitchen and lounge/diner, they are comfortably furnished and children are very welcome. All linen is provided at no extra cost and there are cots and high chairs for the younger members of the family. Entertainment facilities include TV with freeview, CD and DVD players with a free Wi-Fi system plus a selection of books, toys and games and DVDs should the weather be inclement. With Jackie and Adrian on hand for a friendly welcome, Marston is a perfect base for your promised holiday! Comfortable and relaxed family accommodation. All bed linen, bath towels, kitchen towels. One parking space per flat. 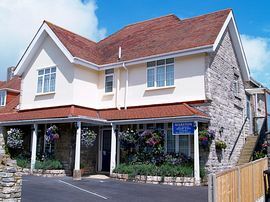 Marston can be found on Burlington Road,North Swanage. From Waterloo Station to Wareham, then taxi to Swanage. To Poole then taxi to Swanage. Then Sandbanks ferry to Studland. Follow road in to Swanage, take tird left turn passed Ballard Stores into Victoria Road, take right turn at top of road in Burlington Road. Marston is on your left. Weekly rates range from £220.00 in the low season to £620.00 in the high season. Nightly rates are £60.00 per night for two guests plus £10.00 for each additional guest. A minimum of two nights is requested. Marston is open all year. Short breaks are available from October to May, with complete flexibility to suit your needs, there is a minimum booking of two nights. "What a great find! 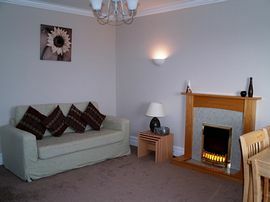 Great flat, great location and fantastic hospitality!" Elodie & Lindsey, London. 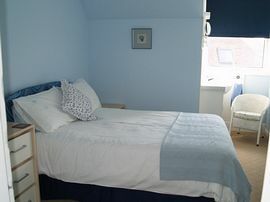 "The flat is the best we have stayed in yet, and we've been coming to Swanage for over 10 years! 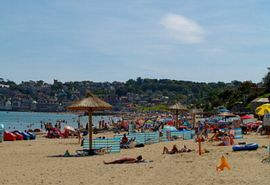 The location is brilliant - the children can go off to the beach safely by themselves and the facilities are excellent. We are looking forward to next year!" The Deeleys, Berks. 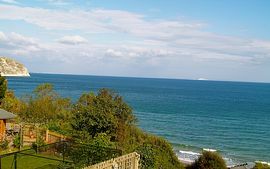 "Brilliantly situated for Swanage and surrounding countryside, flat spacious, beautifully clean and well appointed, memorable holiday - thanks for a great time." Roy and Dinah, London.